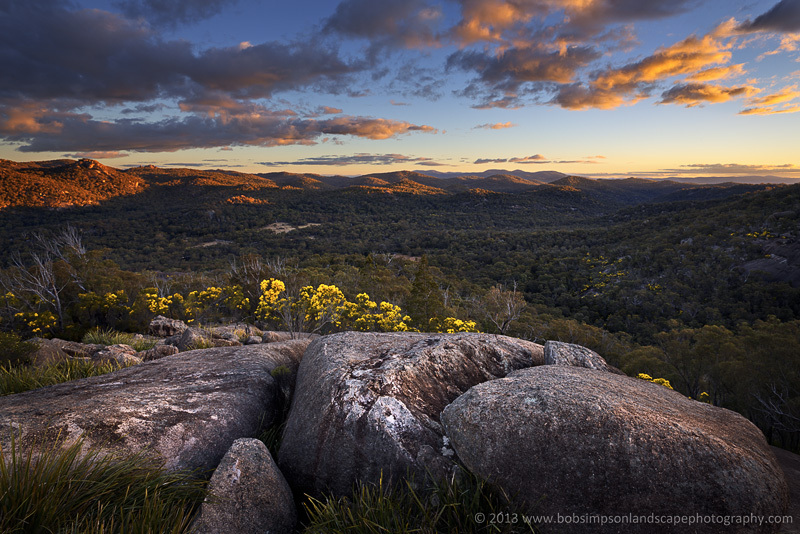 Early in May I visited Boonoo Boonoo (pronounced "Bunna Bunnoo") National Park in northern New South Wales. The Park lies just to the east of Bald Rock and Girraween National Parks, both well known for their wonderful granite landscapes. 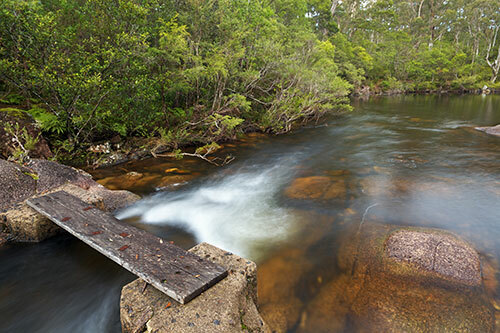 Boonoo Boonoo has plenty of granite too, but its main attraction is the Boonoo Boonoo River that winds through the National Park, and the spectacular Boonoo Boonoo Falls that plunge more than 200m into a deep gorge. 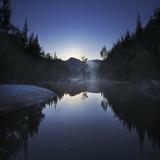 The Boonoo Boonoo River is a major upper catchment tributary of the Clarence River that flows east to the Pacific Ocean. The river and its surrounding areas were significant to the Jukambal Aboriginal Nation, from whose language the name, Boonoo Boonoo, came - it is said to mean either "poor country with no animals to provide food", or simply "big rocks". The second seems to me a more appropriate description, but then I've never been in the position of trying to survive off the resources of the area. Either way, this is rough, rugged country that has no doubt filled its inhabitants and visitors with awe for thousands of years with its massive granite outcrops and balancing rocks. The access road to the Park winds through cleared but rocky pastures before crossing the Park boundary and entering native woodland that is typical of the Granite Belt area. 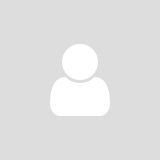 A short drive alongside the river brings you to the Cypress Pine campground where, for a small fee, you can pitch a tent or park your camper under shady trees only a short stroll from the Boonoo Boonoo River. I made this my base for three days. 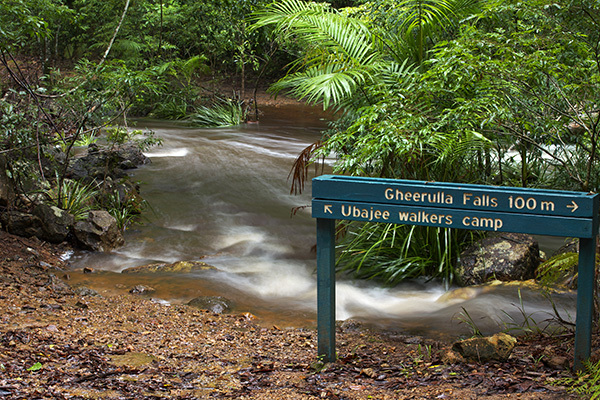 A ~6km walking track from the campground follows the course of the river to the picnic area at Boonoo Boonoo Falls. There are plenty of spots where you can get down to the river from the track to explore and photograph the many cascades and rock pools along the way. More agile hikers can rock-hop along the river, but rugged rock outcrops and giant boulders make this a challenge in some sections and the going can be slow and treacherous. As you near the Falls, the river opens up into a series of big rock pools and cascades before dropping over the edge of the escarpment. This is a wonderfully photogenic section to explore but slippery rocks and steep drop-offs make it a place to take extra care with your safety. This fact was brought home to me when early one morning I discovered a small plaque fixed to a rock just above one of the cascades. I later learned that the plaque was for a teenager who had made a fatal error while climbing around the rocks and jumping into the pools with his friends a few years before. One small mistake in country like this can have tragic results. A fenced viewing platform provides great views down to Boonoo Boonoo Falls and the river valley below. The lookout is famously claimed to be the place where Banjo Patterson proposed to his future wife back in the early 1900s. I'd read about a walking track that continues on past the lookout and eventually brings you to the base of the Falls, but the track has been closed off by Parks rangers because it was considered unsafe. That means there is no easy way to photograph the falls from downstream - something I had hoped to do - and the photographic options from the lookout are limited. Given all that, the best and safest option for photographers is to concentrate on the stretches of river upstream of the falls, which is what I did for most of my stay. There are other walking tracks in Boonoo Boonoo National Park that pass through different types of woodland and forest and no doubt offer photographic potential, but during my short stay I couldn't drag myself away from the river and its rugged scenery. 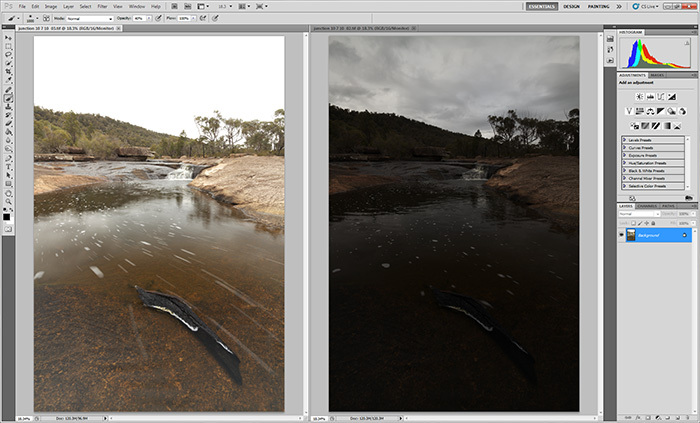 Except, that is, for one morning when I drove the short distance to Bald Rock National Park - but more on that below. 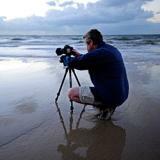 I'm not much of a wildlife photographer but those who are will have a productive time at Boonoo Boonoo. As well as the brushtail possums and bandicoots that frequent the campground after dark, I was excited to get a good look at a quoll one morning on the track to the river - the first one I've seen in the wild. Bird-life along the river is abundant and occasionally raucous when lorikeets move into the flowering gums. From my campsite I also spotted a variety of honeyeaters, yellow robins, eastern and crimson rosellas, fairy wrens, scrubwrens, currawongs, shrike-thrush, and even a pair of lyrebirds. As in much of the Granite Belt, late winter and spring are the best times to see the displays of wildflowers and wattles in bloom. I was a little early for this but it was still possible to find small patches of wildflowers in protected areas among the rocks. I imagine by spring, the rocky hills would be awash with colour. Below are some of my favourite images from the trip. 17mm, f4.5, stars captured at ISO12800 for 25sec, foreground captured at ISO3200 for 114sec. I poked my head out of the tent at 3:30am and was surprised at how much colder it felt outside than in. After a summer spent down at the coast, I knew the mountain air would feel chilly but it was still a shock to the system. I held a torch up to the thermometer hanging outside my tent: -20C. The moon had already set so the sky was black, except for the millions of tiny pin-pricks of starlight twinkling through the trees. Five minutes later I was in the car, with demister on full and wipers trying to clear away the crust of ice on the windscreen. It was a 20 minute drive from my campsite at Boonoo Boonoo to the car park at Bald Rock National Park, and by 4:15 I was on the trail to the summit of the Park's main attraction: Bald Rock, the largest exposed granite surface in Australia - possibly in the southern hemisphere if you believe some sources. Not far into the walk I reached a fork in the track - a torchlit sign told me I had a choice of routes: the shorter option goes straight up a steep granite rock face, and the longer Bungoona Walk winds through woodland before joining with the other track near the summit. Not knowing the area very well, and with a loaded backpack, it was an easy choice to take the more sedate Bungoona Walk. Hiking in the dark focuses all your attention on the track - there isn't much to see beyond the narrow beam of your torch. But as I climbed I was aware of passing through huge rock outcrops and between massive boulders and made a mental note to explore these later on my way down. After 40 minutes or so, the woodland was replaced by wide expanses of solid granite where white markers on the rock pointed the way forward. 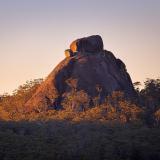 The summit of Bald Rock is marked by a beacon and rock cairn, and a scattering of stunted, windswept shrubs. By the time I arrived, there was a faint glow of the approaching sunrise in the eastern sky, and of course a brisk, chilly breeze making me thankful for the woollen gloves, beanie and fleece I'd brought with me. I dropped my pack and spent some time exploring around the summit by torchlight - in all directions, water-streaked granite slopes dropped away to the woodland some 200 metres below, and to the west, the familiar shape of Girraween National Park's rocky skyline rose out of an ocean of undulating woodland. The first time photographing a new location can be problematic - everything is new and exciting and it can be difficult to focus in on the scenes and features that define the moment for you. I've often felt that a first visit to a new spot yields the more obvious, maybe more cliched, compositions and images, while subsequent visits allow you to view the landscape with some familiarity and capture less expected but more meaningful images. Standing atop Bald Rock before dawn, the overriding sense I had was of the immense and timeless nature of Bald Rock itself, the silence and chill of the morning air, the cascading patterns of erosion marking the (apparently) smooth flanks of the Rock, and how the heavily textured surface of the granite belied this apparent smoothness as it gripped and tore at the rubber soles of my boots and tripod-feet. I tried to capture some of these feelings in the series of images below. After returning home I searched the internet for images of Bald Rock and shouldn't have been surprised to discover that a lot of other photographers and snap-shooters had come up with very similar compositions to many of mine....what was that about a first trip yielding the more obvious compositions? 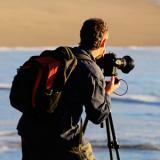 I'm looking forward to the challenge of coming up with something new next visit. Amazing shots of Bald Rock & Boonoo Boonoo Bob!! I have recently moved to the area and no matter how many times I go out to either park I am constantly amazed by them! Thanks for sharing. Thanks for your comment Caitlin. This was my first time to Boonoo Boonoo and second time to Bald Rock, but I've been visiting Girraween for quite a few years. I love the whole area and will definitely be heading back to Boonoo Boonoo this coming winter. Might see you there! It is a stunning area! Fantastic to hear you will be back at Boonoo Boonoo - looking forward to seeing some more pics. If you have a 4WD, Basket Swamp (next to Boonoo Boonoo) is quite amazing as well.